I wonder if that title put you off? Actually, I just want to be absolutely honest with you about i) the challenge and then ii) the benefits of exercise. There are so many reasons why we don’t exercise enough: we don’t feel like it today; we don’t like gyms; we haven’t found a class; I’ve never done any exercise and not starting now; it’s too difficult; I’ve injured myself; I’m too stiff; I’m too tired, and the big one here, I’m too busy! I get it, I really do. Don’t think for one moment that I find exercising easy. My whole approach since last year has been helped hugely because I finally found the right class – it took me over a year of going from class to class and rejecting them all, until, well, I knew immediately it was the right one for me. It’s Pilates. Consequently, as a result of going regularly to a Pilates class since April last year I stand straighter and my core muscles are stronger. My Pilates teacher is also a personal trainer and she set me off on the road of extra exercises during the week, plus weights. But. Due to my inconsistency in September, and not doing classes and exercises during that month, the two steps forward I’d taken became three back with an old injury of a trapped nerve in my shoulder worsening. By early January I’d given up the daily exercises and (you’d think I’d connect this with giving up the exercises) I was becoming so, so stiff and that round-shouldered look was returning. You think I look reasonably fit? You should see me when I get up – I lean forward and over to the right and am stiff as a board. I take over an hour to unravel. Note to self, never get ill and have to stay in bed for any reason. I’m glad to report that I’m back doing the daily exercises, but I’m taking it very slow. And that, my personal trainer would say, is the way to do it. Do not rush into excessive exercising! Btw, re: the idea of running that I have every now and then? In actuality, I never get beyond week 2 of Couch to 5K but have decided, come the Spring, to have another go. There is so much evidence out there that activity brings about well-being and sharpens the mind. Here’s one piece of research out of many, saying that physical activity and increased motor skills contribute to a cognitive reserve, and that this activity even impacted on those with dementia. I’m minded to write more about the NHS once a certain thing here in the UK is resolved (see My Other Blog for my view on that!) but I’ve always thought that we, as in us, should work on our fitness before we get frail. 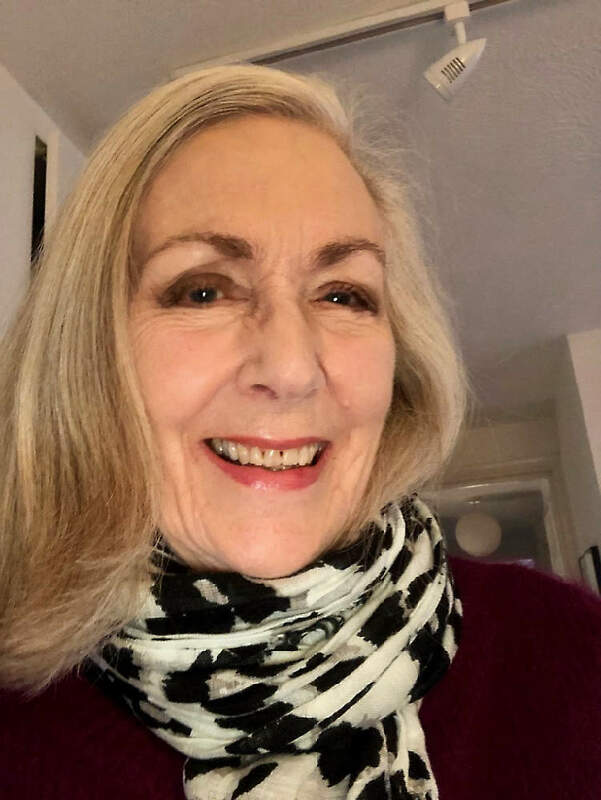 While it is so easy to slip back a bit, I do feel so very strongly that we have to take some responsibility for our ageing and not just expect to get stiff and old, because, hey, that’s what happens. No, we can do a lot for ourselves! And the NHS is apparently catching up on this with something called social prescribing (read more about it here) although it looks at the moment, to be still at the research/pilot stage. But prescriptions for the gym? That would be so good! And there is another benefit that you get from joining a class – the feel of the class and the people you meet there. I haven’t yet had a coffee and cake with any of my class, but I might do! Apparently, cake after Park Runs (which is what I aspire to) is a big thing! Btw, don’t think I’m here to preach. I fall off the wagon and get the hump like everyone else. But here are a few pointers which you can respond to by saying, well no I won’t do any of that, or yes, perhaps I can, or even, I’m doing this already! First, ask yourself: what is your blood pressure; how are your joints; do I have osteoporosis; am I fit enough? Do check your general fitness with your local health/general practitioner and be aware of your body and what it can and can’t do. Doing more exercise is not about joining a gym, I haven’t! And it need not be about joining a formal class – it can be whatever you want to do. You could join a rambling group; do the podcast Couch to 5K (and if you’re like me and you don’t progress, never mind, at least you’re attempting it); walk into town instead of taking the bus; learn to cycle, or dance. And don’t say I can’t because of my age. I’ve just listened to BBC Breakfast about getting more people cycling and there’s a 70+ woman telling us she started cycling at 70! And if you’re worried about safety on the roads, for her the initial training was the thing that reassured her and gave her confidence to bike anywhere including roads. I’d definitely recommend getting a Fitbit to check exactly how many steps you take during a day. I want to know if I’m doing too few steps, and am pleased when I see I’ve done a lot. And they’re great if you’re having an indoors day, for whatever reason, because every hour the Fitbit tells you to get up and take 150 or 250 steps – I like that! If a Fitbit is not for you, consider a simple pedometer, it could be an eye-opener. I’d say push yourself. Go for it and get out of that comfort zone. There’s nothing like a challenge – mine is the Park Run thing, which does elude me, but it’s my challenge to myself, and I’ll be working on this in the Spring. And you know what? All of this exercise lark, which is definitely about keeping you fit and healthy as possible while we age, it is also about having fun. Exercise makes you feel good – why wouldn’t you do it! 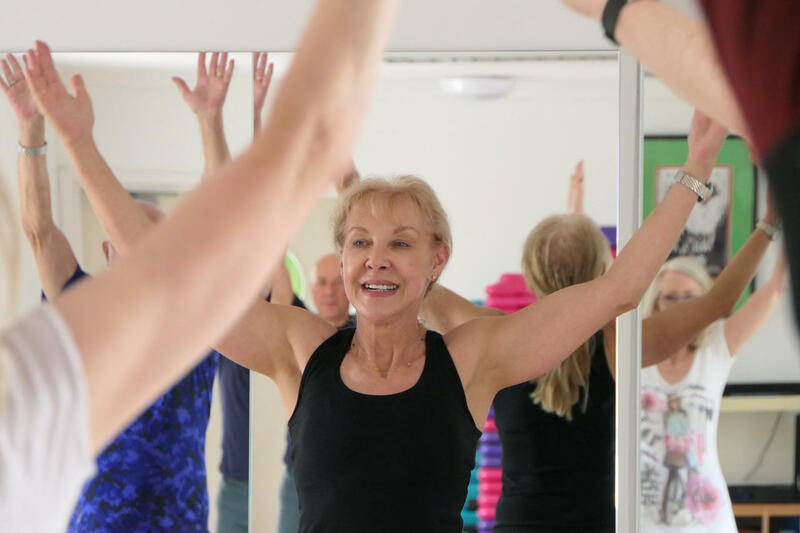 And here are a couple of pics of my class and class teacher, Sarah (taken and supplied by her link here) to reassure you that joining a class is great. My aim in life is to have arms like that into my 80s. Note also the class teacher is adjusting our posture. Never join a class where you just copy the teacher – that’s no good at all. That’s all for now about exercise. Btw, YouTube continues to go well but no new videos. My next one will be about putting on a dark eye shadow look for the daytime – end of week, hopefully. A bit like this. Thanks for your encouraging blog, Penny. I, too am stiff and need to unravel every morning. My grand daughter has set up a pedometer on my phone and although my steps target is very low, I do miss it if I have to miss a day. And I am sleeping better too. A Fitbit sounds interesting, maybe next birthday. Hi Joanna, I know exactly what you go through every morning! Sometimes I take longer than an hour to unravel, but eventually I do, phew! Penny, you are so right about exercise. The more you do it the better and easier it is and the less you dislike it! My other half has Parkinson’s and our gym has special Parkinson’s sessions. He is fortunate in that he has a good amount of residual fitness which has stood him in good stead. There is no cure of course but the constant message from Consultants and Parkinson’s UK is that exercise is the best shield against progression of the condition. Sometimes the old cliches are truest and “use it or lose it” is definitely one of them. Coming up for my 60th next month and still running, hill walking, swimming, yoga, pilates, gym, dancing – and socialising while I do it. People constantly say to me “you’re so lucky to be so slim and fit, what’s your secret?” It’s not a secret, and I can tell you luck has nothing to do with it but keeping fit, healthy eating and aging well are. I’m so sorry to hear about your other half’s condition, but it’s great that he had residual fitness and is carrying on doing the exercises. Yes, agree, now I’ve got back to the routine – I feel so much better! And yes, again, so true, you have to work at this ageing business. One of the most motivating reasons for exercising – for me, anyway – is to keep my mobility. I count my blessings, that at sixty-five, I’m able to walk and we’re talking 10k upwards and that I love walking! If I don’t get out for an hour’s walk, I can go stir crazy. I also have the right kind of gear for when it’s wet and cold! The only thing I’m lacking (currently!) is a dog. We’ve always had dogs and think that is one of the reasons I love walking. I also dance – Zumba and Fitsteps, each once a week. It makes me smile and we have an excellent teacher. As you say, it’s very important to have someone who checks that you are exercising properly. I love my Fitbit, although I try not to be obsessive! Great, and honest, post. Wow! 10k upwards! Yes, I had a dog (so lovely, but never replaced) and I’m sure we walked as much as that every day. Now I keep an eye on my steps through the Fitbit, which isn’t quite the same as whatever the weather you went out! Like you I love my class and always feel good after it. Thanks June, it’s so important not to sound preachy about exercise, but to be honest about being human and not doing it all the time. But boy are there consequences from not exercising – I really don’t want to slip back again! Thanks so much for the kind words, Penny – and for the very sensible advice. You’re right: from my perspective, too, a lot of it is about finding the right person (or group of people) at the right time, so don’t give up if things don’t click straight away. Keep on trying because the person and the activity are out there. Lots more on my Facebook page, if anyone wants to have a browse – Wellbeing Exercise. There’s a lot I also want to add to your mention of social prescribing, too, one major point being that the powers that be are hoping that the likes of me will provide classes and general expertise for free. I’d love to, as would other exercise professionals I know, but we do have to make a living. However, if you have a health condition, it’s worth asking your GP whether there is a medical referral scheme in your area, under which the NHS sends you to appropriately qualified professionals (could be classes, gym, swim, walking groups, pretty much anything) who will train you for some months and get you moving again. If all else fails, start by walking, preferably somewhere green. I promise you’ll feel better for it. Poor old NHS, it really is overwhelmed in so many ways, but you’d think they’d do a cost/benefit analysis of prescribing exercise. Including payment to the gym or personal trainer. It must work to their benefit! There is considerable evidence that prescribing exercise saves a lot of NHS money in the longer term – fewer GP visits, fewer drugs, fewer operations. One (admittedly small) study found that spending £2,000 with an exercise professional saved £10,000 in GP time. The problem is that somebody has to identify suitable candidates and set up the system, then pay for it, before seeing any benefit. Easier said than done at a time of cut-backs. Two tips for all of us fortunate enough to follow Penny’s blog. Well! Give those a try! Thank you Margaret – good tips. I wore a heavy shoulder bag (on the left side) for years and am sure that this had a big impact on my morning ’tilt’. My osteopath often used to comment on this and now I never wear a shoulder bag or carry a handbag. Instead I have several backpacks. The palm turned forward is part of one of the exercises I do regularly now. You are so right Penny, as I found to my cost three years ago when I had an ‘out of the blue’ massive heart attack aged 64. Previously I was only slightly overweight, walked for 20 minutes most days and ‘didn’t believe in exercise’ as such because it seemed friends were always getting sports related injuries. Well I now exercise properly because my life depends on it! I did cardiac rehab and then found a fabulous class, Happy Hearts, that took to rehab exercise to new levels. I now love going twice a week. The key is to warm up and stretch properly and cool down gradually afterwards. I start out with stiff muscles and joints but ten minutes in we move on to circuit training, involving weights, resistance and cardio, all to fantastic music from the 60s onwards. The oldest person in the group is over 85 but there are plenty my age or younger. I get the endorphin high that I had never experienced in my life before and am happy to be sweaty, what does that matter now I’m retired! I intend to be as fit and healthy as possible for me, with a good diet and plenty of exercise. Oh my goodness, Jane, I’m so very glad you survived and are now fit, happy and healthy! That class sounds amazing. I used to love circuit training and did it for some time but a change of class teacher (not as good) led to an injury. This was the other shoulder to the more recent one. I’m glad to tell you that Pilates is really helping that side and after several years I’m able to have full movement in that arm. Exercise really works! And you’re a great example of the good it can do you! Thanks for your kind words Penny. What also helped was the unintended loss of two stones bringing my weight down to well within healthy BMI and the weight I had been before having children. That made exercise so much less stress on my joints. I commend you for focusing on exercise. I’m not sure if it would have prevented my heart attack but it certainly protects my heart now, which is after all the most important muscle in our body. I totally will give it another go. And just turn up for a ‘run’ and see what it’s all about. I do want to do this. Oh it’s so important to exercise or to work out. I feel so much better when I’m in the flow of working out for times a week! I love it! Hiya Judy! Your sewing must be very similar to me sitting at my laptop, but my Fitbit has just buzzed me to get off my chair and move!!! So I will! I so agree with your exercise advice, Penny! I am in a Jazzercise program here in the Los Angeles area. Do they have something familiar in the UK? In my younger years, I loved dancing parties and here I am, 70 years old, dancing and swinging my hips yet again! We also use hand weights and I can feel that my core has gotten stronger and I’m balancing myself much better. I get to Jazzercise class 2-3 times per week. Ages run from 40’s to 80’s and, boy, do we have fun. On off days, I try to walk 2-3 miles in my neighborhood. Trying to keep fit and active for my grandkids! Thank you for this reminder/encouragement! I’ve heard of Jazzercise but not done any – sounds fun! Actually I love dancing so will look for a class. Thank you for this reminder – which is much appreciated! I will add that I’ve not appreciated every instructor but finally found one that teaches 3x/week. My fee pays for unlimited one-hour sessions which are offered both mornings and evenings, everyday of week. Penny – I’ve enjoyed your make up videos very much! Agree wholeheartedly about exercise. As you know I’m a regular walker but I’ve let my Pilates/Yoga stretches/ mini-work out lapse and I must get back into it. I started off in a Pilates class with an excellent teacher. She did exactly what your photos showed – adjusted position etc and I was pleased to see several men in your class. There were in mine, too! I gave up because the times of classes weren’t always convenient and thought I’d carry on at home; you know how that goes! You are such a role model with regard to walking, Vronni, but Pilates is just the best for strengthening the core which is as I’m sure you know so important. I wouldn’t be without my Pilates class, but actually on reflection I could do more cardio. The week has been good, although as I age (and yes, I am saying that!) I find that winter perhaps doesn’t suit me as much as I think it does. I don’t like hot weather and always say I prefer, the winter but in actuality maybe it isn’t all that good!!! Weather is warming up tomorrow though – yay! Exercise is so important as we get older. Elderly people who are prone to falls often do so because their core isn’t strong enough. We may not actually see the benefits of exercising but it’s what is going on inside that’s important. The gym I attend is one aimed at the over 40s (women only) where the instructors are trained differently to those in conventional gyms. They are very good at incorporating prescribed physio into an individual’s exercise programme. We have had members up to the age of 88, members who walk with sticks or a frame and those with debilitating conditions. The gym management recognise that mental wellbeing is as important as physical and provide free refreshment in a nice coffee room where we can chill and chat. I can’t speak highly enough of it. It costs me £30 a month and is worth every penny. Your gym sounds amazing and there should be something like it in every town. Brighton is awash with gyms of very varying quality and price. The gym that holds the class I go to (not a member) is so friendly and nice if I wanted to join I’d choose this one. 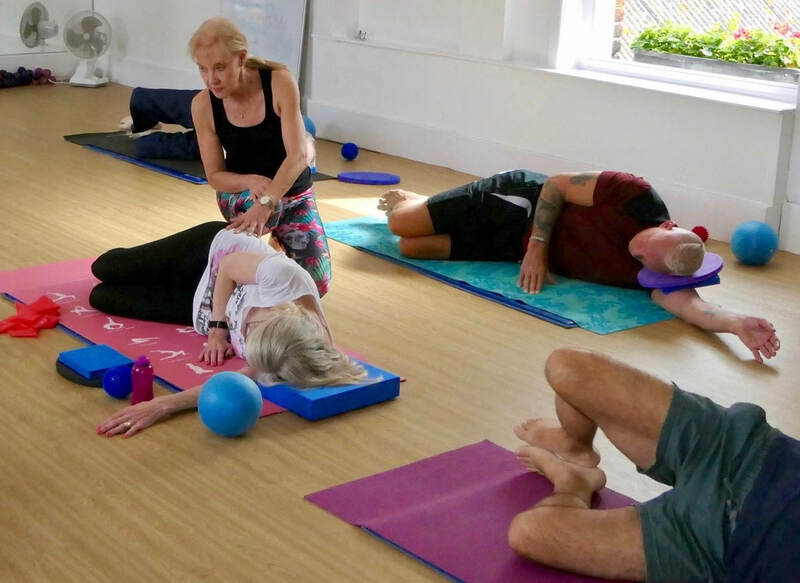 I am so fortunate to have found this class as our teacher Sarah adapts the Pilates for all varieties of conditions and strength and corrects our postures. On a one-to-one basis she is entirely focused on the particular abilities of the individual, which is as it should be. Once you find something like this, like you, it is worth every penny. Encouraging post Penny, I must admit to falling by the wayside with my exercise lately. Partly due to my breathing problems but hopefully they are now sorted and that it has really been way too hot for Zumba, its held in a local hall with no air-con and not many windows either. Now back walking , lifting my weights and hopefully Zumba this coming week.Keep up the good work, your instructors toned arms are certainly to inspire to. I cannot imagine doing Zumba in Australia with the current heat!!!! Glad to hear your breathing is sorted – phew, that was important! Apart from walking & using stairs whenever available I’m still looking for a personal trainer who understands my health problems. I used to swim regularly but not done that for over a year – the local pool is scruffy as a new centre is going to be built by 2021. I’m waiting for blood test results as my chronic pain has got worse recently. I know that more exercise is what I need but lack motivation at present. I’m trying to do small things at home like standing on one leg, not pulling myself up from chairs, or loading the washing machine, by holding on to something, a habit so easy to slip into. I also dance around to music- I love dancing. Even small things can help if you do them regularly. However, anything where I have to bend my neck or use my arms increases the pain and that includes typing so I’ll stop now! Oh, Lynda I’m so sorry to hear about the chronic pain, do hope it can be sorted. As far as a personal trainer for you and your particular needs, I feel every Age Concern should make it their business to find these personal trainers. Likewise GPs should too. I know they’re overwhelmed but part of that is always fighting the crisis. Instead, why don’t they concentrate more on building up health? They too should have a list of suitable personal trainers for a variety of conditions. But of course, there always was something called Public Health that focused more on prevention, which was within the NHS. Then it was moved to the Local Authority which everyone thought such a good thing, and the money for it was always going to be ring-fenced – oh yes? Well it isn’t now Won’t go on….. I stood on one leg as I made the morning tea. Standing on tip toe whilst in the kitchen (both legs) is also good! Take care and have a good week. P.S. Did you see the comment from Sarah Gibbings above – her first one? Do ask the GP if such a scheme is in your area. Thank you for linking up. This blog makes me feel a little down as I was so fit, for me and its relative as I’m no gym junkie or marathon runner, and my back situation is setting me back. I keep thinking how hard it was for 18 months to get to the point I was and no can’t push myself. Oh well. I do need to be careful. Now my instructor who is in her 60s said she wanted to be the fittest 80 year old she could be and she talked of functional flexibility such as feeding the cat and reaching cupboards so as well as cardio exercise she had us doing functional stretches. Hope to see you on this weeks link up. Yes, every Monday and I hope someone will help me create a badge as I am flumoxed. RE: your back. Oh no, don’t feel down. I remember having a dreadful back once when I was working – the commute was hell and it was a time-limited project with things that had to be done – taking time off was so difficult and the working at home thing wasn’t as advanced as it is now. I remember sniffing into a hankie at the osteopath and asking whether I’d ever get better, and of course, I did, as you will. I wrote this post because I had slipped back, but was improving once I restarted very gently. But that blasted trapped nerve shoulder which I though practically finished with came back yesterday evening – felt quite down about it, too!!! I do think the cold makes our muscles contract and seize up more so the warmer weather coming this week is so good!!!!!! Take care and see you at the link-up on Wednesday! So glad you mentioned parkrun on your blog, Please share that you can start parkrun by walking the course too. Most parkruns now have a tail walker and everyone is pleased to see you whatever your level of fitness. Many of our walkers have a little trot every now and then and then the bug hits because you feel so good about yourself and then you decide you would like to beat your time (you get your time emailed to you each time you run and you only compete against yourself – if you want to of course) All for free! You could also voluteer if you do not feel up to it, and still go for the tea and cake afterwards and make some new friends some may become goods friends like my running buddy. I need to up my game – I go to three Power Plate classes a week, which is all about muscle resistance, but I get very stiff and achey so need to do more yoga. Plus I need to do something aerobic, but I get bored to death on machines and have tried running many times, but it’s so hard if you’re knock kneed. As the weather gets better hopefully I will do more walking. Great message Penny, I believe everyone should get active. The NHS is nearly at breaking point, imagine it in ten years’ time! Hi Gail I am slightly knockneed too and wear a stability running shoe which help enormously. If you really want to give running another go get help first from your local running shop by having a gait analysis you trot on a tread mill in different shoes whilst they video your feet and when your ankles and heels are aligned those are the right type of shoes for you. Our local shop charge £15 for the gait analysis which are knocked of the shoes if you buy them but you are not under any obligation to do that.